After the busy work week, there's nothing more relaxing than a leisurely Sunday brunch. Good eats and good company can only be perfected by good frozen concoctions - so grab some ice and your Margaritaville® Jimmy Buffett Anniversary Edition Key West™ Frozen Concoction Maker® and mix together some delicious creations. This Frozen Concoction Maker® makes hosting brunch easier, giving you the satisfaction of serving impressive frozen concoctions to guests. A bloody Mary is a Sunday morning brunch go-to to take the edge off - especially after a Saturday night that lasted a little too long. Keep the party going - at a more relaxed rate, of course - with a frozen rendition of the classic cocktail. The ice will perk you up in no time while just a dash of hot sauce will put some pep in your step. Add ice to the reservoir and mix all ingredients together in your Margaritaville® Jimmy Buffett Anniversary Edition Key West™ Frozen Concoction Maker®. Pour into tall glasses and garnish each glass with a celery stalk. Mimosas should always be on the menu for a relaxing Sunday brunch. The cocktail is the perfect concoction to sip slowly as you start the day - it's light, refreshing and brings back those vacation vibes. Enjoy a sparkling frozen mimosa as an easy-to-make accompaniment to eggs Benedict, sausages and whatever else is on your brunch menu. Add ice to the reservoir and mix all ingredients together in your Margaritaville® Jimmy Buffett Anniversary Edition Key West™ Frozen Concoction Maker®. Pour into champagne flutes and garnish with orange wedges. 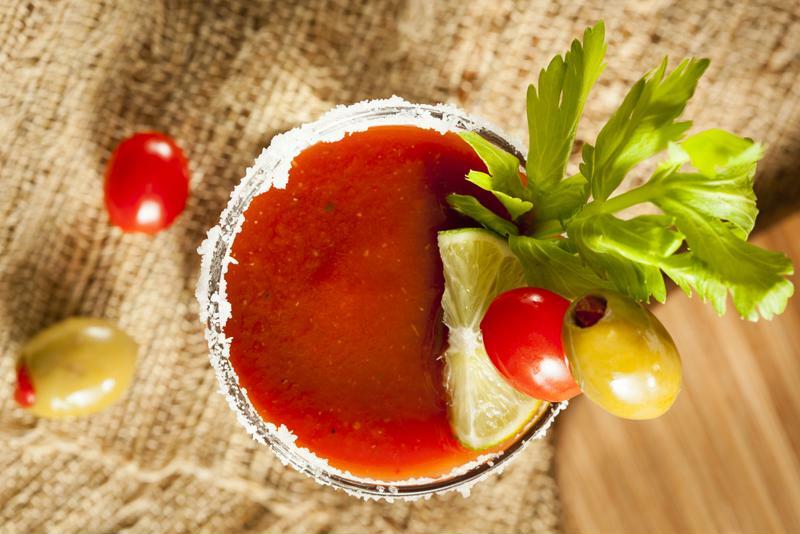 A bloody mary makes the perfect brunch cocktail. If you're settling in to a delectable brunch of savory and sweet dishes, mojitos are a great pick. They balance out the menu by providing some light and smooth refreshment. This recipe for frozen mojitos keeps the cocktail's characteristic mint freshness but adds some juicy and unexpected blood orange to the mix. Add ice to the reservoir and mix all ingredients together in your Margaritaville® Jimmy Buffett Anniversary Edition Key West™ Frozen Concoction Maker®. Pour into tumblers and garnish with a few fresh mint leaves and slices of blood orange. Is there a better lazy-morning meal than a pile of fluffy pancakes drizzled with rich maple syrup? Give the wonderful flavors of maple a fun twist by incorporating them into this one-of-a-kind maple bourbon frozen concoction. Remember, it's always 5 o'clock somewhere, so let this frozen concoction be the star of your Sunday brunch. Add ice to the reservoir and mix all ingredients together in your Margaritaville® Jimmy Buffett Anniversary Edition Key West™ Frozen Concoction Maker®. Pour into tumblers and garnish with a sprinkling of orange zest. Having a group of friends over for Sunday brunch? Mix up a large batch of this eye-catching frozen rosé punch. A fizzy little sipper combined with fresh berries is just what the doctor ordered. Add ice to the reservoir and mix all ingredients together in your Margaritaville® Jimmy Buffett Anniversary Edition Key West™ Frozen Concoction Maker®. Pour into wine glasses and garnish with fresh strawberries. Put the ice back in iced coffee with this frozen cocktail. It's a fun and indulgent way to enjoy coffee that will rev you up so you can make the most of the rest of the weekend. Add ice to the reservoir and mix all ingredients together in your Margaritaville® Jimmy Buffett Anniversary Edition Key West™ Frozen Concoction Maker®. Pour into coffee mugs and top with a swirl of whipped cream.